Wiratan began her UMBC research career as a high school senior, working with mentors Marcin Ptaszek, associate professor of chemistry and biochemistry, and Nopondo Esemoto ’12, biochemistry and molecular biology, and a current Ph.D. student in chemistry. “She learned both theoretical concepts and experimental techniques quickly,” Ptaszek recalls. Once enrolled at UMBC, Wiratan began work with Hua Lu, associate professor of biological sciences, and Chong Zhang, a postdoc in the lab. “Dr. Lu constantly encourages me to be a creative and driven scientist and cares deeply about my well-being in and out of the lab,” Wiratan shares. Linda Wiratan ’19 collects seeds for her plant genetics research. Marlayna Demond ’11 for UMBC. Wiratan’s research today focuses on the relationship between the circadian clock and innate immunity in Arabidopsis thaliana, a model plant species. Specifically, she is examining how the plant’s defense system, when activated by pathogens, can alter the plant’s circadian clock. Her results demonstrate that the relationship clearly exists, but is complex. The research has important disease-control applications for agriculture and even human medicine. “Linda has been a key member in my laboratory to study this topic,” says Lu. Wiratan independently developed an undergraduate research award proposal and is a co-author on a research paper under revision in Nature Communications, a premier international journal. Beyond her impressive scientific journal articles, Wiratan has also written for broader audiences. She co-authored a piece in The Conversation, an online news outlet that connects researchers with the general public. 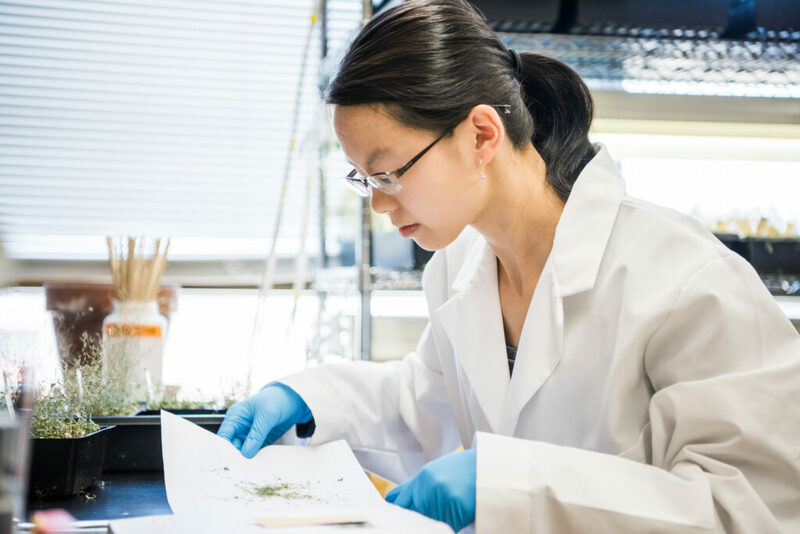 Her article introduced readers to the idea that studying plants can inform precision medicine, and it was republished in Smithsonian Magazine online. Wiratan has even founded her own social entrepreneurship organization, City of Cells, LLC, which focuses on improving the public perception of science through creative work, such as an online journal, science-inspired home furnishings, and educational animations. She does all this while maintaining a 4.0 GPA. For Wiratan, being named a Goldwater Scholar is particularly gratifying because her success has not come easily. “This scholarship symbolizes the culmination of years of hard work and endurance,” she says. “I have always loved science and research, but growing up I have been faced with so many challenges.” She thanks her mentors—Ptaszek, Lu, and Simon Stacey, director of the UMBC Honors College—for their support in helping her confront those challenges and grow a sense of inner strength, resilience, and confidence that has propelled her forward. In 2016, Daniel Ocasio ‘17, Naomi Mburu ‘18, and Andreas Seas ‘17, all chemical engineering majors, received Goldwater Scholarships. Banner image: Linda Wiratan stands in front of flats of her research plants. Photo by Marlayna Demond ’11 for UMBC.